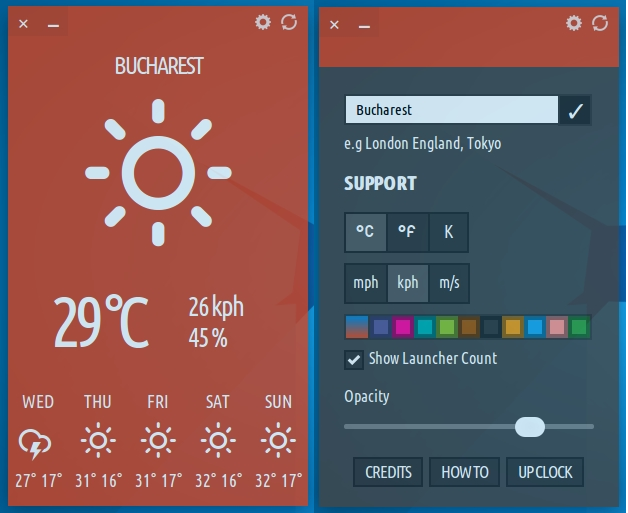 Typhoon is an open-source weather application, forked from Stormcloud 1.1, which is not available for free. It permits the users to change the colors to integrate better with the system wallpaper and theme and adjust the application’s opacity. The latest version available is Typhoon 0.8.9, which has been released a while ago, but now its PPA has received packages for Ubuntu 15.10 Wily Werewolf. The installation instructions should work on all the supported Ubuntu systems and derivatives: Ubuntu 15.10 Wily Werewolf, Ubuntu 15.04 Vivid Vervet, Ubuntu 14.04 Trusty Tahr, Ubuntu 12.04 Precise Pangolin, Linux Mint 17.3 Rosa, Linux Mint 17.2 Rafaela, Linux Mint 17.1 Rebecca, Linux Mint 17 Qiana, Linux Mint 13 Maya, Pinguy OS 14.04, Elementary OS 0.3 Freya, Elementary OS 0.2 Luna, Deepin 2014, Peppermint 6, Peppermint 5, LXLE 14.04 and Linux Lite 2.